Third-Party Manufacturing in Sikkim – The North-Eastern state of India, Sikkim has a flourishing pharma sector giving chance to many pharma companies to grow. SwisscheM healthcare is the leading pharmaceutical company in India that is best-known for formulating, manufacturing, supplying and marketing of quality products. We are accredited with ISO and GMP units and use the computerized technology for manufacturing and packing the drug solutions. We provide the Third-Party Manufacturing in Sikkim with a wide range of pharma products in the form of the tablet, capsules, injectables, pellets, protein powder, herbal nutraceutical, etc. SwisscheM Healthcare is a renowned name in providing the quality pharma products at an affordable range. Third-Party Manufacturing means employing the other company for the manufacturing of pharma products. Deploying other companies for manufacturing provides the time to focus on marketing and research competitions. We at SwisscheM Healthcare manufacture more than 300 pharma products and medicines and provide them at reasonable rates. Hi-tech machinery and Team of experts that are professional and hard-working professionals enable us to complete to the demands of high stock medicines on time. So, we are the best pharma company to opt for Third-Party Manufacturing in Sikkim for the production of medicines. 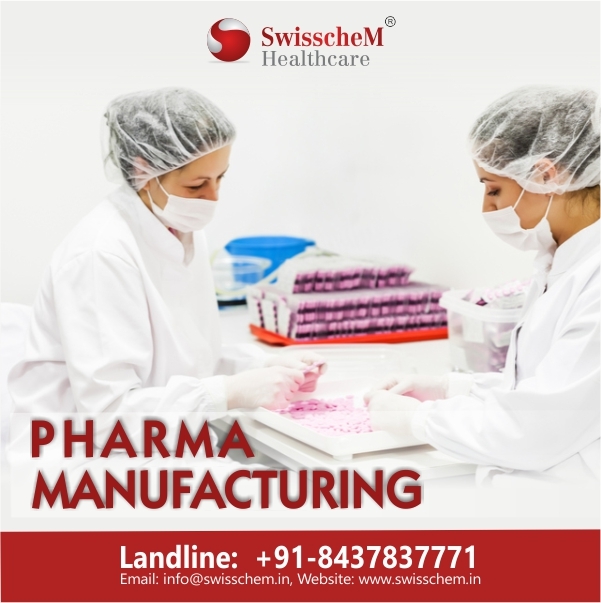 If you are searching for the best pharma manufacturing company in the area, SwisscheM Healthcare is the best. The company provides the best business opportunity with a wide range of health and medical products at affordable rates. For more queries, you can contact us at +91-8437526778 or +91-9780917734 or you can mail us at Swisschemhealthcare@gmail.com. All these products are DCGI approved that means they are quality assured. These medicines cover different drug markets like antibiotics, anti-infective, anti-viral, anti-allergic, etc. SwisscheM Healthcare is known for its quality manufacturing service in the pharma market with the aim to expand its base throughout India. The variety of medicines manufacturing with a qualitative and safe attribute has won the trust of many top pharma companies. The company has a profound name in the field of pharma manufacturing. We are certified with the global standard parameters for the pharma manufacturing. The large-scale manufacturing infrastructure that is equipped with the latest technology machinery helps us to prepare the bulk orders on time. Our dedicated team is embraced with the professional and skilled professionals that are indulged in formulating the innovative medicines. The clinically approved raw material is brought into use for the preparation of quality medicines. The environment for the manufacturing process is hygienic and ventilated. SwisscheM Healthcare is ISO 9001:2008 and GMP certified pharmaceutical company. The formulation and manufacturing process are surveilled under the WHO and DCGI units that check the quality of pharma products. We manufacture more than 250 medicines and provide a third-party manufacturing facility throughout India. There is an emphasis on quality packaging too to bring non-contaminated medicines. The manufacturing unit is established in taxation free zone. So, our associates can enjoy the taxation concessions. The hard-working and dedicated staff is efficient in completing the heavy market demands of medicines. On time delivery: On time delivery with the quick system is one of our special features. SwisscheM Healthcare values the time and is engaged in delivering all the pharma products on time. Quality production: We are certified with strict global standards like ISO, GMP, DCGI, and WHO. All these parameters show the quality measurements of drug solutions. Fine grade material is used to manufacture the quality medicine. Cost-efficient production: The company is equipped with all the latest technology machinery that provides the cost-efficient output of pharma products. The team of experts is efficient in their work to bring quality outsourcing with optimal use of resources. Tax-free manufacturing: We have our manufacturing units the Excise duty-free zone. So, our associates can enjoy the tax concessions. Why Choose Us for Third Party Manufacturing in Sikkim? SwisscheM Healthcare has the customer-centric and business-centric approach. The company provides the best manufacturing facility to other pharma companies through it’s large-scale and hi-tech manufacturing infrastructures all over India. We have more than 10 years of experience in formulating and manufacturing the quality medicines that make us the best pharma manufacturing company in Sikkim. The company assists its associates with the strategic marketing tools in order to enhance the pharma business. We have the vast capacity of manufacturing, that enable us to complete the assigned market demand orders on time. The company facilitates its clients with reasonable and affordable prices of pharma products. Our quality services have won the trust of many reputed pharma companies and are happy to work with us. To know more about our Manufacturing services in the region, contact us at the details given below.